In a discussion with Tokyo Metropolitan Government Audit and Inspection Commissioner Kimie Iwata which ran in Chuokoron under the title “The uneven distribution of doctors which led to discriminating against women in medical school entrance exams,” Chuo University Professor Toshiki Mano noted that for many years medical care in Japan has faced a problem of an uneven geographical distribution of doctors and care, with differences in the number of hospitals, hospital beds and doctors, and stated that the root problem of the Tokyo Medical University scandal of discriminating against female students in entrance exams “lies with the problem of an uneven distribution of doctors.” He also explained that in a situation unique to medical departments, “Graduates often work in the university hospital after finishing their degree,” and so entrance into a medical school is also essentially a job interview, leading to discrimination in favor of male students at the time of entrance exams. Iwata noted that although according to information released by the Ministry of Health, Labour and Welfare there are sufficient numbers of doctors, Japan has one of the lowest numbers of practicing doctors by population among OECD countries, and suggested, “There may not actually be enough doctors.” According to MHLW data, doctors are expected to work “an excessive amount of 60 to 100 hours per week,” and she indicated doubts that limitations were being considered when raising children, to allow for increased numbers of female doctors. According to Iwata, approximately 20% of female doctors quit when giving birth and raising children, in response to this excessive work environment. 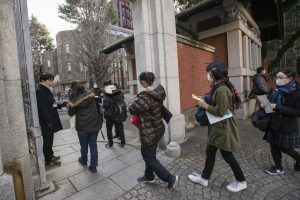 In an essay titled “Using both arts and science will create the future” in Voice, the University of Tokyo Professor Shunya Yoshimi stated that while “The quality of the students is no different (between top universities in Japan and the US),” when it comes to higher education in Japan, “The system does not improve students’ capacities for thinking intellectually or creatively, so that they may compete at a global level.” He noted that one of the structural issues with the education system is that courses “have been subdivided to an extreme degree,” so that the number of courses Japanese university students have to take is too many when compared to students in the US. If students do not make a sincere effort to systematically structure their education, they will end up not learning much.